and stitching it was even better! In the post below this one, you will see the pattern and the "muslin" (test garment) for this style. I only needed to make some very small changes to arrive at the finished shirt, involving the shape of the sleeve cap. It just needed to be a little flatter and a bit longer. Balancing details is important when designing menswear that differs from the norm. I did not want this shirt to veer into "western" territory, and of course I did not want it to look like a "blouse". So I added a traditionally shaped pocket, and carried the piped accents of the yoke to the sleeve and pocket. The addition of a white band collar cut straight at center front (rather than rounded) and traditional white shirt buttons "marching" down the the front placket finish the look. SEWING NOTES-- Shirting fabric from www.GorgeousFabrics.com, Collar interfaced with Pro-Woven Shirt Crisp Fusible Interfacing from www.FashionSewingSupply.com Buttons are from the Light Assortment of "Buttons-by-the-Scoop" from www.FashionSewingSupply.com. I started this design last week, but have been very busy since my blog-interview with the lovely Gertie! When finished (sometime next week, I hope)...this will be a Man's Shirt with a one-piece *angled* wrap-over Yoke. Excuse the poor sketch (I cannot draw) and blurry pic of the "working pattern". 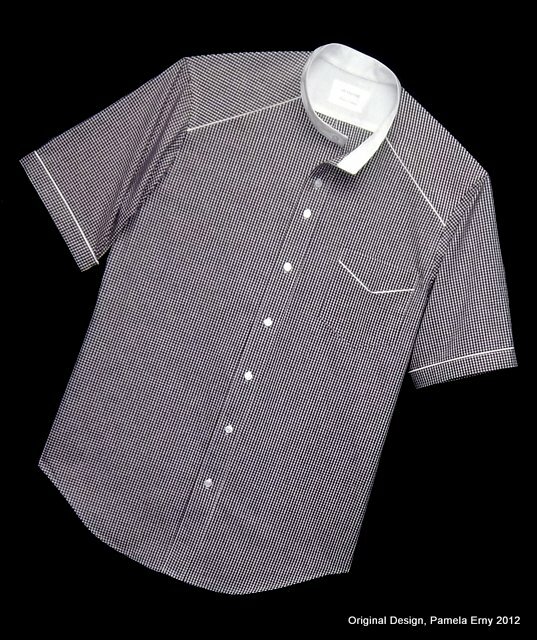 When drafting a shirt for a man where the yoke wraps over the shoulder and ends at a deep angle in the front, shape needs to be "built-into" the yoke so that the shirt lays smoothly along the shoulder. While you will sometimes see a design like this for women or children...there are very few angled (one piece) yoke styles found among commercial patterns for men. In menswear this look is usually accomplished by a separate piece that is stitched to the shirt fronts (like western shirts, for example). I was taught to iron my finished shirts in this manner during my shirtmaking/tailoring training, and have been doing it this way for 30 years. 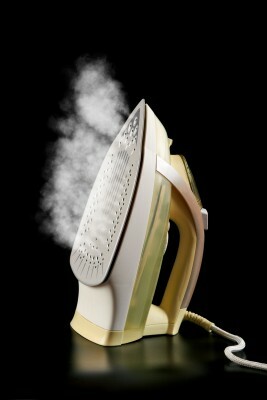 ...and yes, this is "ironing". Iron one "cuff and sleeve" and the associated half of the yoke...then iron the other "cuff and sleeve", and the remaining half of the yoke (only one sleeve side is demonstrated in this video). Note how only the CB of the collar is ironed when folded. Remember to fasten the top button before ironing the body of the shirt...it makes a huge difference. Perhaps the most useful tip in this process that will make the most difference in how your pressed shirt looks is this-- Use the heel (back wide end of the sole plate) of your iron to do the "work" when ironing places like the cuff and collar. This is fully demonstrated in the video, and really does make a difference!